As of June 16, NRC officially remains in normal response mode as the levels of the Missouri River rise and flood preparations are underway at the Fort Calhoun nuclear power plant in Nebraska. But behind the scenes there is lots of activity designed to ensure the safety of the plant. NRC is augmenting its resident inspector staff to provide around the clock coverage at the site. In addition to the two resident inspectors permanently assigned there, four other NRC officials have been sent to site. This includes three inspectors and the chief of the branch overseeing the plant. A roster of other inspectors has been drawn up from which additional inspectors can be dispatched if the need arises. 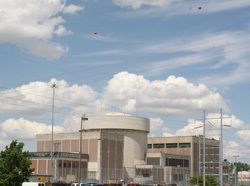 Officials at the NRC’s Region IV office in Arlington, Texas, have been conducting daily conference calls with the station’s managers to monitor preparations and potential impacts on the plant, which is located about 19 miles north of Omaha. Exceptionally heavy rainfall and snowpack runoff led to this spring’s flooding of the Missouri River Basin that is reported to be the most severe the region since the 1950s and 1960s. Flood conditions are expected to persist for months. The NRC’s Region IV office has contacted the National Weather Service and the Federal Emergency Management Agency to review weather and river level predictions. NRC also plans to establish regular calls with FEMA, states and local response organizations next week for coordination purposes. Events at the site are being closely followed by regional news media and Internet bloggers, whose attention was galvanized on June 7 when the plant declared an Alert following a fire in a switchgear room. The fire was quickly extinguished, but briefly knocked out power to two pumps circulating water in the spent fuel pool. This triggered reports that the plant’s spent-fuel pool was in danger of boiling and releasing radioactivity, prompting unfortunate comparisons with the accident at Fukushima. As the level of the Missouri River continued to rise over the past few days, more and more news media helicopters buzzed the area. This prompted Omaha Public Power District officials to contact the Federal Aviation Administration with a request that they remind pilots of the NOTAM, or Notice To Airmen, in effect since September 11th, 2001, restricting the airspace around the plant. Similar NOTAMS are in effect for all of the nuclear power plants in the United States, as well as other elements of the critical infrastructure, and are meant to discourage pilots from flying too low or lingering in airspaces. Unfortunately, this was misinterpreted by some of the media who reported that FAA had closed the airspace over the site. This suggested to some Internet bloggers that things were much worse than officials were publicly admitting, spurring reports that the airspace over the plant had been closed because of a release of radiation. An advisory that had been sent by NRC to the Department of Homeland Security was similarly misinterpreted, leading to reports that operators had flooded the containment building to protect the reactor. The rumors have been as difficult to combat as the rising floodwaters. Moderator Note: In addition to the NOTAM, which remains in effect for all nuclear plants, in response to a request from Fort Calhoun on June 6, the FAA issued an additional NOTAM tightening, but not closing, the airspace around the plant. Aircraft are now restricted from flying within a two-mile radius of the plant below 3,500 feet. I recieved my first and only reply on this matter from the IAEA in Stockholm, Sweden. I have been trying to get a decent overall reaction to the situation for 2 weeks. The Omaha ABC affiliate is covering the story now but I haven’t checked the site since yesterday morning. I didh’t stop to get the link. Be safe everybody, we are out here thinking of you. Anyone who has lived in the midwest, like I did for 30 years, knows that June is the beginning of the stormy summers there…. lots of severe storms, tornadoes, RAIN… One cannot possibly believe that the levels of the river are going down… to the contrary, they will rise. They are not using common sense: 1. water seeks its own level, explain to me the logistics of a water berm holding out more ater. 2. the midwest summer weather pattern is not a secret… so explain to me how they can actually think people will believe the flood levels will not rise? 3. I have family in Omaha, and they are all watching the river RISE and the flooding get WORSE… water levels are not receding… we should be demanding the truth instead of buying into their lies, which a 6th grader could poke holes through. I would like to know what the hell you have to say about this? The lack of information is astounding and unacceptable. The PUBLIC has the RIGHT to know what is going on… NOT what YOU deem we need to know. We are grown and can handle the truth… this is a comment from a family member of mine in the area and I want to know what you have to say about it? How is that water berm working out for you? Water seeks its own level, not sure exactly HOW a water berm was ever expected to keep out water… it isn’t a sand berm… it is WATER! WELL?? What is going on? So where’s the pictures now since the rubber weenie busted? I’m guessing there won’t be any…. The 1994 report on the 1993 flood showed a lot of leakage into radiologically sensitive areas in the lower areas of the buildings at Cooper. I think important plumbing and electrical stuff is in there? It’s not the reactor itself, it’s the plumbing! Fine. Then you need to put out daily releases with a ridiculously high amount of media (still & video) so we can see for ourselves that things are well under control and not at risk of the same disaster at Fukushima. It was the WATER there that decimated that nuclear complex and cast all of Northern Japan into a horrible fate. It wasn’t the design of the plant that did it but greedy and terrible management. Having seen the very recent AP article that the state of the nation’s nuclear plants are rusting — to the point of leaking — and safety margins are being reduced, we do not trust you! “Why didn’t the NRC post any follow up information about the June 6th incident at the Ft. Calhoun NPP?” I would think the answer to that question is very simple. The NRC reported at that time, that the issue with the wiring for the cooling pumps was corrected, and there really has been no new developments since then requiring notification. If you expect the NRC to mollycoddle every curious person in the country, after they have reported all the pertinent information, why not just get your mother to read you a bedtime fairy tale, and maybe take same Valium to calm your nerves. They did their job, and that’s what they were supposed to do. And they are still doing it. When the statements during the first few days of Fukushima changed from “any danger” to “any immediate danger” we knew we were an acceptable risk, collateral damage, mere statistics. To us you are a machine, an automaton without feelings or humanity, making no decisions that are made as a human but as a corporation, an entity without conscience. That’s US, the people YOU work for, and knew you served when you signed up for this job. I could argue on the point of reason, water has non, people do. Or that we are now more educated as a society after Fukushima and the subsequent Senate hearings, and to expect us to have our heads in the sand still is to underestimate our lack of trust in how nuclear energy is being handled in this country. This is not sensationalist produced fear. It is an honest intelligent response to an industry that is failing in many ways. If you would like my laypersons, joe public list I can follow up with that. At this point I would like to say that the rumors are a direct result of a failure to consider the needs of the public. We need to sleep at night, which means that we have to know if the nuclear plant down the road is stable, and if not, can we trust out regulatory system to inform us in a clear, honest and timely matter of the degree of instability? The loud and clear answer, proven by the hunger with which these ‘rumors’ were accepted and forwarded, is no. My point, that there was, and still is, a failure of clear and consistant information flow to the public is made in the link below. I thank you for offering this forum. I hope next time I do not have to go to the IAEA to get my first answer about what is true and what is rumor. Can you clarify that the reference to two feet of water is for areas not protected by the aqua dam, as the impression may be given that there is 2 ft of water within that protected area. Also, both this blog and the new document refer to rising water. Can you confirm whether water levels are rising or falling at the site and by how much. The OPPD Flood and Outage blog refers to levels falling slightly between June 15 and 17. Wednesday, 6:00Pm EST, and 8 inches away from the Cooper Nuclear Plant’s shut down point, concern is an appropriate response. I’m writing here simply as a concerned citizen. I am very concerned about the what appears to be a failure by the NRC to abide by their own commitments to transparency and honesty as well as a failure to meet common sense expectations that the public holds for an essential public safety agency like the NRC. The NRC web site lists a news release for June 8th, 2011. That release describes the events that took place at the Ft. Calhoun NPP, specifically the failure of electrical switches due to flooding, the subsequent failure of the pumps that keep the spent fuel rods pools at the proper temperature and the situation was corrected. I think it’s reasonable to conclude that this was a newsworthy event on it’s own and that recent events in Japan would result in a strong increase in public concern about such an event. However, since that news release, there has been no mention of this in any other news releases from the NRC. Personally, I find this surprising and I’m very concerned about this glaring gap in reporting by the NRC. I’m not interested in hearing about standard reporting procedures as a explanation or justification by the NRC for failing to follow up with subsequent reports about this incident at Ft. Calhoun NPP. Common sense and simple concern about the public as well as a desire to avoid unwarranted rumors would dictate being as open and transparent as possible re: an event that is monitored by the NRC. Yet the delay in posting the the one news release and the absence of any follow show that the NRC is living up to those expectations. Why didn’t the NRC post any follow up information about the June 6th incident at the Ft. Calhoun NPP? Was the NRC subject to any outside orders or influence from the Executive Brance or any other government agency that affected it’s handling of the news reports re: the Ft. Calhoun June 6th incident? If so can you provide details about it? “Wow, some of you people are amazing. What ridiculousness nitpicking trivial details trying to invent a conspiracy.” Really? Let’s look at this from a logical , non-hysterical perspective – a great deal of time and effort has been placed on denying rumors and painting a rosy picture. Obviously if there was any good news, it would be plastered on every page of the internet and beyond. Instead of spending time denying rumors, how about giving us some facts. Pointing out standards that were written umpteen years ago, showing pictures from weeks ago, accusations of conspiracy theories and inability to comprehend the complexity of the situation only promotes anger and disbelief. I think it’s a quite natural reaction to consider the possibility that nothing is being said so that there is no accountability. People can handle the truth whether it is a nothing burger as you claim or something more, but they can’t stand having the truth withheld, twisted, or manipulated. The public would like to know what is going on in more detail, even if it’s nothing. At 0402 CDT on 6/19/2011 a Notification of Unusual Event was declared due to the elevation of the Missouri River reaching 899.1 feet above mean sea level. This is above the Emergency Action Level HU1.5 elevation of 899 feet. The Missouri River is expected to crest at 899.5 feet within the next couple of days. It is expected that the elevation of the Missouri River will remain above 899 feet for most of the summer. Actions are in progress in accordance with the site flooding procedure, including strategic placement of sand bags at building entrances and important facilities. There is no major plant equipment out of service at this time. Personnel access to the site is not presently impeded. Emergency evacuation routes remain available. “On 6/19/2011 at 0447 CDT, Nebraska Public Power District issued a press release concerning the declaration of a Notification of Unusual Event declared today at 0402 for the Missouri River elevation above 899 feet above sea level. “This is a four hour report per 10CFR50.72(b)(2)(xi) for any event or situation for which a news release is planned or notification to other government agencies has been or will be made which is related to heightened public or government concern. State and local agencies were notified of the expected news release during the NOUE notification. Minor release of radioactive material unlikely to result in implementation of planned countermeasures other than local food controls. At least one death from radiation. Fuel melt or damage to fuel resulting in more than 0.1% release of core inventory. Release of significant quantities of radioactive material within an installation with a high probability of significant public exposure. Conspiracies happen everyday… and media cover ups happen every day too… just give some straight answers – up front and it wouldn’t happen. It is insulting to be treated as if we cannot handle or understand what is going on… I speak for myself when I say: I am not an idiot, please don’t treat me as one. Name-calling is a short-cut to rational thinking. And using the epithet “conspiracy theorist” is the new “leprosy” or “infidel” or “blasphemer”, meant to immediately trivialize or demonize the person without having to go through process of examining the details of what the person is saying. There is nothing “inherently safe” about storing 1,000 Hiroshima’s worth of radiation in a box, no matter how sophisticated that box may be. The nation has had to endure 40 years of selective education, obfuscation, and minimization of risk at the hand of specialists dealing with a pretty arcane technology. We’re sorry if the questions seem nit-picky or overly basic, but we’ve experienced too many instances where common sense gets swamped with techno-babble, with no accompanying enhancement of either safety or security. Yesterday’s AP story about the NRC is a litany of instances proving that point. Please refrain from considering this emergency an instance of “conspiracy theorizing.” If anything is conspiratorial, it’s the redundant offensive blather of NRC’s vocabulary (“robust” “enhanced” “within regulatory limits” “no member of the public was immediately harmed”) accepted as “fact” by an uncritical, poorly trained media. If the people around Fukushima had been a little more “conspiratorial” in demanding as a group answers and accountability to the hard but simple questions, they might not be enduring the suffering they’re in right now. Ft. Calhoun is currently within the “Notification of Unusual Event”. You can read more details about this particular event on the preliminary notifications page. I think a lot of people are concerned when they see pictures like these. I am not a conspiracy theorist but these pictures are quite alarming. They were taken on June 16-18 and the river has risen since then. Wow, some of you people are amazing. What ridiculousness nitpicking trivial details trying to invent a conspiracy. The real issue is the safety of the plant. Between this and OPPD’s pictures and answering questions, it seems all is in as good a shape as can be expected. The plant is dry, the reactor is safe, there’s no radiation. Yeah, it’s great to ask questions, but at some point, you look like loony conspiracy theorists. Is the Nebraska plant still safe? We have many friends and relatives in that area. I have a simple question , what is the current level of alert at the Ft Calhoun and Cooper plants, It has been said that you use a system of 1 – 4 , what level are they at and how do we find this information? The four emergency classifications set by the NRC are listed below in order of increasing severity, according to the NRC website. Notification of Unusual Event – Under this category, events are in process or have occurred which indicate potential degradation in the level of safety of the plant. No release of radioactive material requiring offsite response or monitoring is expected unless further degradation occurs. Alert – If an alert is declared, events are in process or have occurred which involve an actual or potential substantial degradation in the level of safety of the plant. Any releases of radioactive material from the plant are expected to be limited to a small fraction of the Environmental Protection Agency (EPA) protective action guides (PAGs). Site Area Emergency – A site area emergency involves events in process or which have occurred that result in actual or likely major failures of plant functions needed for protection of the public. Any releases of radioactive material are not expected to exceed the EPA PAGs except near the site boundary. General Emergency – A general emergency involves actual or imminent substantial core damage or melting of reactor fuel with the potential for loss of containment integrity. Radioactive releases during a general emergency can reasonably be expected to exceed the EPA PAGs for more than the immediate site area. I am sorry, but your reference to that FDC NOTAM is quite weak. “Pilots are strongly advised” does not mean anything, particularly so if you are a news chopper that needs to report about a flood that is creating some concern in the general population. And in any case, there is a TFR above the NPP, established with FDC NOTAM 1/6523 on June 6th, and as a pilot I take a TFR in a much different light than a generic FDC NOTAM like the one you listed in your message. On top of everything, saying that nothing different happened in the airspace above the Ft Calhoun NPP is plain wrong, and I’ve proved that what Mr. Dricks originally said was incorrect. No wonder there is now a new note added at the end of Mr. Drick’s message. But unfortunately that note is wrong too, as a TFR is infact a no-fly zone, so the airspace below 3500′ and within 2 miles of the Ft Calhoun NPP is effectively closed. Not sure I get why the note specifies ” tightening, but not closing”. A TFR is a TFR, even though it’s only 3500′ thick. But still, that airspace is closed. THIS IS A RESTATEMENT OF A PREVIOUSLY ISSUED ADVISORY NOTICE. http://www.faa.gov/air_traffic/publications/notices/media/2011-06-02.pdfSorry Futuro. there is a Special notice as quoted below and has been since 9/11. This is the latest reissue. The NRC comment is correct. The temperature in the spent fuel pool at Ft. Calhoun rose from approximately 80 degree Fahrenheit to about 83 degrees. Here is the link to the event report on the fire: http://www.nrc.gov/reading-rm/doc-collections/event-status/event/2011/20110608en.html#en46932 . I am sorry, but as a pilot I find the statement that all NPPs have been subject to NOTAMs after 9/11 a load of blowing snow. There are no TFRs (temporary flight restriction areas) above NPPs in the USA, simply put. Once again, genuine lack of good information will expose the Nuclear Industry to attacks from the usual fear mongers which will use the TFR as a way to spread more fear, uncertainty and doubt. I wish that Mr. Victor Dricks could have done his homework a little better before posting false information on a public blog of the NRC. As a pilot, I believe that the most likely reason for the TFR being established is to avoid having too many news choppers around the NPP reporting “live from the scene”, avoiding collision between choppers in an area which has been already severely damaged by the flooding. I wish that the NRC could change their statement now, but the damage is done. And this is bad, particularly so as it comes from an agency of the Federal Government. You should know better before posting false information, Mr. Dricks. I think this is a good example of what a lot of the local people feel is happening. I hope this gives clearer picture. We shall see what these horrible storms do. Perhaps the rumors would be fewer if the most current information posted wasn’t 4 days old. OF course antinuclear people are going to be concerned about any accident. Nuclear pleants are dangerous. An accident could contaminate a huge area of the country and kill many thousands of people. Ever heard of Chernobyl, or Fukushima? OK then the OPPD should release recent pictures and video of the plant to the news media, or preferably should invite the news media into the plant . Is the picture on this page a recent picture of the plant? The OPPD release says that the water level is at 1004 feet above seal level. What the release does NOT say is what the level at the reactor is. Now, why would the OPPD leave out this obviously essential information? Also, the no-fly area over the reactor is intended to prevent news organizations from learning-and reporting-on what it happening at the reactor. Its apparent that the OPPD is intent on concealing the state of the reactor. Victor, I am trying to understand all of this and have done much digging. Some things I found I posted below from an article I am writing. They include links from the FAA that show the text of the NOTAM’s, the issue dates, the reason for the NOTAM and the expected duration. Care to explain why on the FAA website these were just issued in June of 2011? NOT Sept 2001? There is one over Ft. Calhoun and one over the Cooper plant… as well as some 30 additional no fly zones that have popped up lately. If you aren’t being honest about the no fly zones… can we assume the rest of your post is questionable as well? 6/6/11	Issue date: FAA issues a temporary no fly zone over Ft Calhoun, until further notice, hazards. 6/7/11	Issue date: FAA issues a temporary no fly zone over Cooper, until further notice, hazards. I’m not sure what the NRC means by “Internet bloggers” but as one of those “bloggers” dealing with facts not fiction about the issue here it is. Any vital structure built in a flood zone should be built fifty feet above maximum possible flood height, then protected with reinforced concrete (not dirt). Make islands. That simple. A levee is a barrier defense. Once breached, it’s useless. Islands are dispersed, local defense. Loss of one threatens no other. Made properly at the right locations, floods are too low to threaten them. Islands don’t require reconstitution after a flood. Live in flood range of a river, build MUCH higher than the river. If it’s in a tornado zone, add reinforced concrete. As essentially the chief operating officer of the NRC, Mr. Borchardt is speaking for the NRC staff in the briefing of the Commission that you cite. Reponse to Jame G…….There are many anti-nuclear folks who are actively working to dispell the rumors regarding the flooding situation. Additionally, they continue to work to dispell the rumors put out by the NRC that a Fukushima can’t happen here. Victor… there is no such thing as a “no fly zone” over US nuclear plants. It really probably wouldn’t matter if the NRC allowed the media inside to document everything, there are a lot of conspiracy theorists that misinterpret information and are always looking for ways that the government is hiding something from them. Hopefully, everything at the NRC will be kept under control and the general public can carry on with business as usual. That is a good question, what is Objective Truth…. I have found the same article reposted by many websites, but it is exactly the same article every time, with no variation. As far as I can tell, it originated at a website called “European Union Times” — which the Southern Poverty Law Center (I’m sure you are familiar with them) has identified as a very dubious new source run by US skinheads. So, Jane…. though I am a mother for peace, I doubt the validity of that particular article. Plus, it says that there is a news blackout, which isn’t the really the case. Local news channels have been covering the issue. Thank you for you reply to my first post. I am wondering if the NRC as an organization agrees with the comments below of Bill Borchardt? I did not see any posts or links at the IAEA site when I was on it. I did leave a request for accurate information. The first news report was a video on the internet posted by a news agency that was told not to approach the site by boat. The waterway is public but has expanded to the doors or the NPP. That was the first report that I saw and it looked pretty bad to have sand bags all around a NPP on the same stream of video as a levie breaking up river. There was noone watching the sandbags, the river was 6 inches from breaching them. Also, the complete lack of local coverage would raise the concerns of residents. If this just comes down to a really bad public relations job on the part of the NRC or Nebraska Emergercy Man. Agency then all the better. The point is that people need to be kept informed with the truth. Wether one is for or against nuclear I believe we all agree that safety is the way to handle it. Could you post what the temperature was in the spent fuel pool before the fire and what the max was it climbed too after the power went out, in Fahrenheit please? The news just keeps saying it was a small rise. While you might try to down play this event, and it may be nothing, I hope you can understand the public’s concern with this. It seems more and more in the last few months we keep hearing the nuclear industry say “well we never could have foreseen an event like this, the plant was simply not designed to handle something of this magnitude”, be it tsunami, tornadoes, or massive flooding. Let’s be very clear a disaster at one of your plants can destroy much of the country for hundreds of years with just one “unforeseen event”. And we are not fooled by those in the nuclear industry who keep getting on these posts talking about how we have it all wrong. We know you get a paycheck working for some utility, so no matter what the safety record is you are going to be pro nuclear. Any credibility the nuclear industry or NRC had was lost when the public found out that your plants have to constantly have power or they will self destruct. How they were ever allowed to be built is the real question. You cannot guarantee outside power or resupply of petroleum fuel. Just because nothing has happened yet doesn’t mean it won’t. Just one event that knocks out the power grid and the US is finished because of these nuclear plants. Look in the news solar flare, cyber attack, or EMP congress is having hearings right now. We are on borrowed time. The nrc better start fixing these plants to survive long term black out or start digging bunkers so at least somebody might survive long enough to get out of the radioactive wasteland formerly known as America. As the blog post points out, there are significant rumors and misunderstandings associated with recent events at this nuclear power plant, one of which is the characterization of the short-lived fire. The request to the FAA to remind pilots of the NOTAM came from the Omaha Public Power District, not the NRC. The NOTAM was put in effect after 9/11 as a security precaution. It’s a given that anti-nukers are not only going to milk and exaggerate and “re-imagine” the smallest “incident” at any plant, even a spilt bucket of barely irradiated water, for all fear’s worth while the iron’s hot, so it’s beholden on the nuclear industry not to take it on the chin and Aggressively hit back at willful and pernicious disinformation and fear sowing. One thing Fort Calhoun could do is IMMEDIATELY invite members of the local community on a tour of the plant to assure them that it’s not on the cusp of Doomsday. Second IMMEDIATELY publicize what was posted here on the media regarding the FAA incursions. Show the up fearmongers for what they are! Do not get cocky that things will blow over. If it were up to me I’d make a clean sweep of every public affairs office of every nuclear facility and install a crew that knows how to touch and relate and constantly educate the people of their community and region and take the Dark Vader mystery and demonic peril tall tales out of nuclear energy. Thank you Atomic Power Review for the great at unbiased public education. Why wouldn’t NRC want the media to take pictures of the flooded plant? Pictures tell people the truth. Clearly this report is in direct contradiction of the NRC’s reported assessment of the situation. How can a citizen know what the objective truth is?